Delete your Zoho Projects portal anytime you wish to discontinue our services. Portal can be deleted by the Portal Owner. Ensure that you have taken a backup of your portal data before deleting it. There are no active users in the portal. All integrations have been disabled. Subscription has been downgraded to the Free plan. Take a backup of your portal data. If the portal meets all the above criteria, you can now proceed to delete your portal. Navigate to Portal Configuration > Org Settings > Configuration > Delete Portal. Enter the company name in the pop-up. It should exactly match the name your provided when creating the portal. This will enable the delete button. Click Delete in the pop-up. Take a backup of your portal data before deleting it. 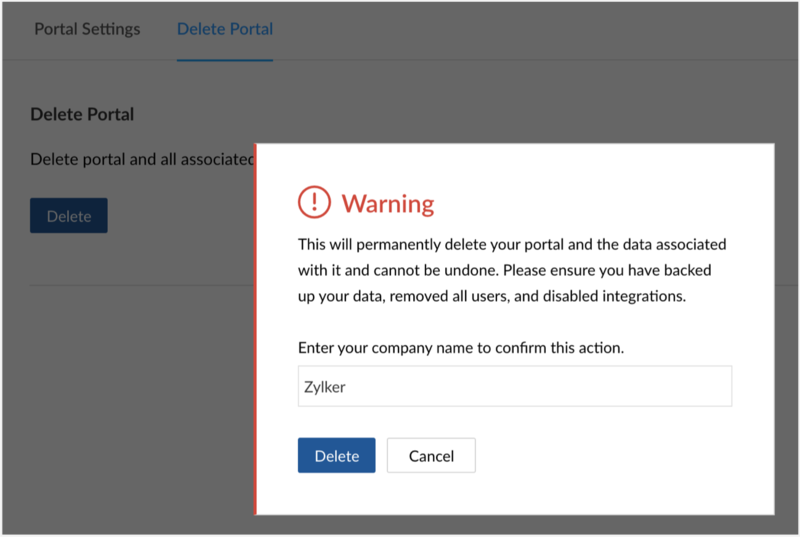 Deleting your Zoho Projects portal will not delete your Zoho account. Your data will be deleted from our data centers after 90 days. You cannot retrieve or access this data during this period.